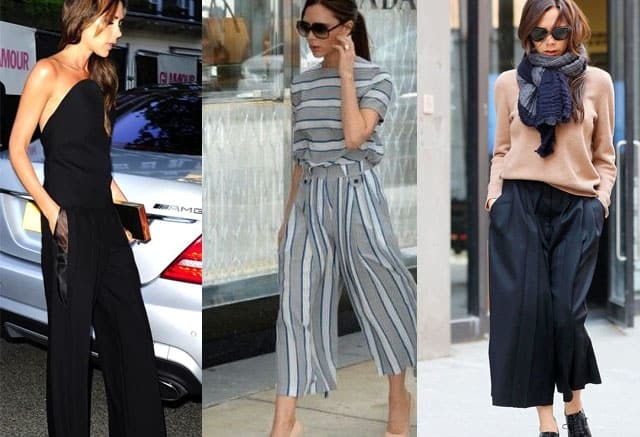 38 -year-old Victoria Beckham has overcome the thorny path of the participating group Spice Girls to the super popular designer outfits that ladies sweep the shelves like hot cakes. At the last ceremony of the «Woman of the Year Glamour» London designer Victoria Beckham was awarded the honorary title of «Woman of the Decade», not only for a successful career, but also for the perfect style, exemplary family and outstanding business acumen. Her certainly can be called a self made woman and set an example to young women who dream of living in the place. Leaving behind colleagues from Spice Girls and forgetting ratings poorly dressed celebrities, Victoria chose a different type of activity and the classic style of dress. In addition to its own brand Victoria Beckham, founded in 2008, the designer prefers brand Chloé, Jil Sander, Balenciaga, Loewe, Céline, Christian Louboutin and Casadei. Victoria Beckham doesn’t deny that her style «was not always so perfect». We all remember her passion for great things, jeans with low waist and leather jackboots. «Yes, it was my life». People often ask me: «Looking at my old pictures, you experience the aesthetic revulsion?». And I answer: «No». Everything changes. My last experiments with style, hairstyle , make-up helped me to eventually come to my current way», — said the designer. Two years ago, in a large family a happy event happened Beckham: Victoria gave birth to her fourth child — her first daughter. Joint outs Victoria and Harper will be a source of inspiration for young mothers. Because even a small daughter the former pop star wears stylish and sophisticated. Unlike many fashionistas, Beckham rarely seen empty-handed. The latest trend, created by herself, has become a roomy rectangular bag. According to the designer, a massive accessory must be worn for holding the bottom. Whatever the variety of shading doesn’t represent designers, black will always remain a universal color for all occasions. Restrained and elegant, it is suitable for people who do not need labels as their names speak for themselves. It is to such people and is Victoria Beckham. Her often can see in elegant dresses in black tones. Beckham has formulated 5 basic fashion rules to help women look good. Victoria Beckham rarely leaves the house without sunglasses. Some believe that in this way her protects the eyes from the flashes of cameras, while others believe that because Vicki hiding «age-related changes». Beckham herself says that the glasses are just an accessory: «Never forget the sunglasses; they will become the final point for any outfit». Victoria Beckham is a longtime fan of jeans (in her wardrobe for more than 10 different models). Designers are advised not to spare money for the garment and be sure to buy skinny jeans. «It’s all about proportions and stretch — jeans are perfectly sitting on a figure, — explained the ex-peppercorn. — Narrow dark blue jeans look great both day and night». To their favorite accessories Victoria Beckham applies not only sunglasses and handbags. Generally, she prefers to go out with bright bulky specimens from Victoria Beckham. «Always consider carefully your image. Make sure that accessories are chosen correctly. Don’t forget that the bag can become the center of the dress», — said the designer. If you are going on a secular party, the dress from Chanel and shoes by Christian Louboutin are a great choice, but if you plan to spend a day with the children, such outfit is inappropriate. Victoria Beckham in red bell bottoms and plaid coat. Romantic and cute image.